Provide the set up for your master bedroom while accommodating your storage needs with this door dresser and mirror set. With six drawers, you'll have all the space you need to store clothes without causing clutter. Located at the center are two louvered doors that not only hides an adjustable shelf for storage, but creates a nice visual differentiation as well. 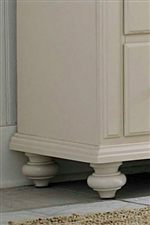 The dresser brings out a casual cottage feel, inspired from the use of turned feet, wooden knobs, louvered doors and clean traditional edges. The complete piece, including the wooden knobs are finished in a creamy white finish, giving the dresser that charming, quaint look you desire for your bedroom. 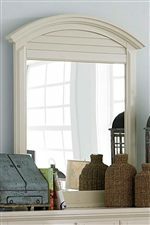 The accompanying mirror is perfect for those seaside abodes looking for a way to bring in the casual, coolness of the coast to their bedroom. 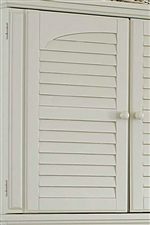 The silhouette includes an arched top with a louvered shutter detail, signaling to a coastal influence. Together the dresser and mirror create the ultimate fresh, coastal inspired vanity set. The Seabrooke 2 Door Dresser with Mirror by Broyhill Furniture at AHFA in the area. Product availability may vary. Contact us for the most current availability on this product.